Steven (Chicagoland, United States) on 3 January 2018 in Animal & Insect and Portfolio. 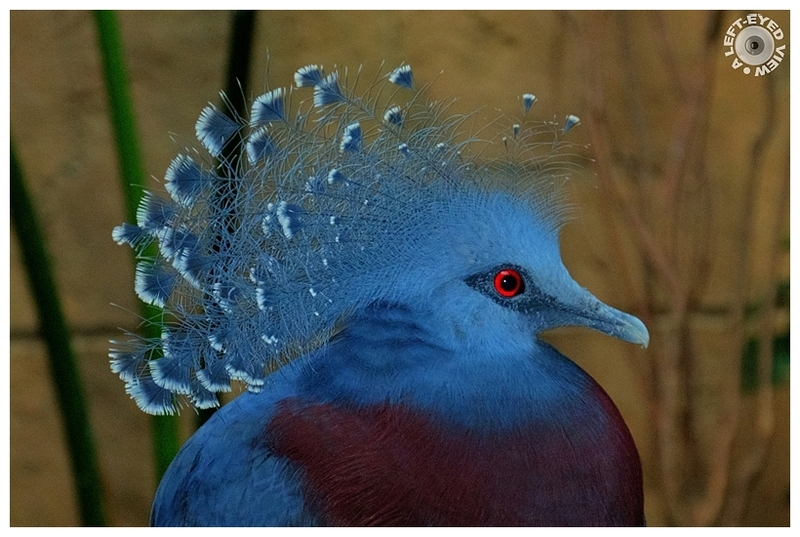 The Victoria crowned pigeon (Goura victoria) is a large, bluish-grey pigeon with elegant blue lace-like crests, maroon breast, and red irises. It is part of a genus of three unique, very large, ground-dwelling pigeons native to the New Guinea region. The bird may be easily recognized by the unique white tips on its crests and by its deep 'whooping' sounds made while calling. Its name commemorates the British monarch Queen Victoria. Photo captured September 28, 2017 at the Niagara Falls Bird Kingdom. Are you sure it's real, Steven!!!!! such beautiful pose, focus & colors! A new one to me . . very impressive pigeon ! Incredible catch !!! Great shot ! well done ! Did you see any tragopans there? Eye popping colour! A gorgeous image of this equally gorgeous bird. I really like the detail and color. Amazing plumage. A wonderful avian portrait, Steven! Excellent focus, bokeh and light management that bring out the beauty of this exotic bird! A gorgeous capture of the feather details and the rich colors. Excellent. A brilliant capture of this spectacular bird. The red of the eyes, it gains immense prominence in the set of the blue of the feathers. une très belle capture de ce joli oiseau Steven..
A nice bleu crow . Waouh ! Quel oiseau extraordinaire !!! That is a stunning bird. So beautiful. Very nicely shot as well.